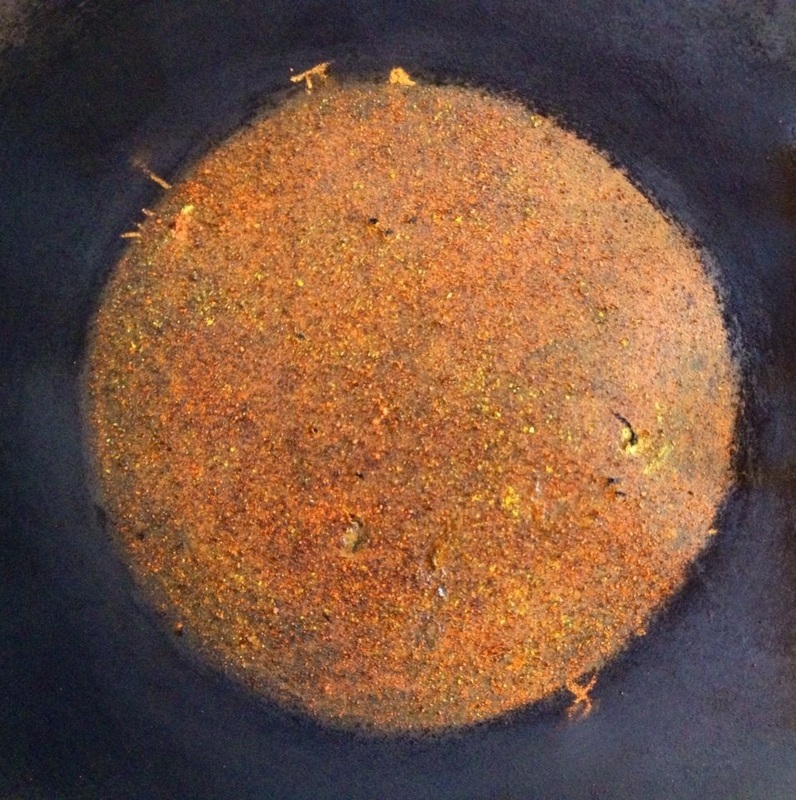 June 18th 2014 A full solar disc experimental sketch . Continuing my drawing experiments in order to capture the complex sun. Active Regions , Plage, Sunspots , Proms, Filaments and Mottling East Limb July 1st.14:19 UT / PST 40 / 8mm eyepiece/ 50X / Wax Crayon and Conte on black card. The long river of plage was really distintive and very complex. I was fascinated watching this large U shaped filaprom hanging off the East limb this morning. Drat I was out of some of my usual sketching material so just went at it another way. As sketched and observed the first view , it seemed to me that the U shaped thin filaprom had another one anchored to it at two points. It was difficult to see the filament part of the lower prom so if it was coming off the higher loop it was unusual in that aspect. The lower filaprom was huge and it appeared to change shape rapidly. So to show it changing shape I just used the same limb sketch to draw it a second and third time under each other. In reality the position of the feature had not changed that dramatically in the short time. However the shape of it did , in particular I liked the lower prom which had a circle of nothing within this swirling exuberance this morning. 14 mm eyepiece with Baader filter paper. I was looking at the Sun Now on the Solar Dynamics Observatory site. Oh that long filament and interesting north limb proms seemed like a target for my PST. So yes observed it and then drew it. Easter Saturday North Limb proms and filaments on the disc. 13:00 UT - 13:55 UT PST 40 - 8 mm eyepiece using Pastels , on black paper. Jan 15th Active Region 1654 - PST 40 h alpha Sketch / 8 mm eyepiece / 50 X - up scaled by eye. 10:42 UT - 11:28 UT Pastel , Conte on Black Paper This region was very complex indeed. My first view of it was yesterday morning. OH boy how to sketch it. ? I tried the binoviewers but they gave too much information to my eyes for the time I had available. So I went back to the 8mm set up and settled down for a sketch. The sun had some interference from chimneys from time to time but the view was awesome. Indeed the limb of the sun was full of proms of all sizes while filaments wriggled over the surface like snakes on sand. 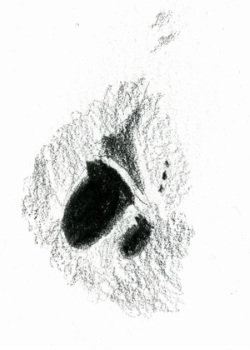 There were no bright bursts from the active region as I sketched. Long areas of plage were flanked by some leaping dark rope like filaments these were flanked closely in parts by fibrils. The entire AR was solar eye candy. The sun and its massive action was then masked by high cirrus clouds so no chance of a white light sketch. First light for my Binoviewers PST 40 2X20mm Eyepieces 2X Barlow = 40 X 09:00 UT - 11:50 UI Pastels on black paper WOW what a view , what a challenge! This was difficult , the filaments were not as dark as I have drawn them. I have to work out a way of doing the fine details filaments offer, this will take some time. The sun is awesome, and even though I know that some areas are lower than others it is not really that easy to show the layers. I look forward to more views and will improve on this sketch in time. 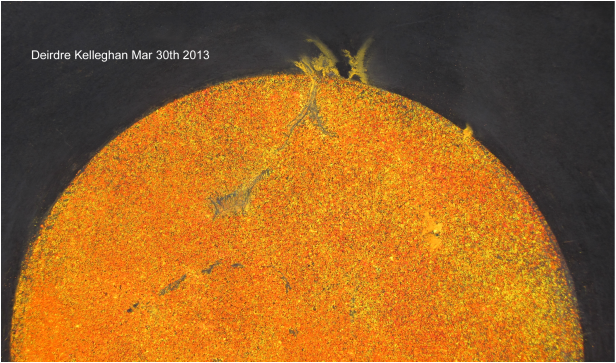 There were several proms on the solar limb but these on the eastern limb seemed to be the most interesting. Some of the magnetic field lines around AR 1283 stood out for several seconds in good detail so I sketched them in with pencil over the pastel. That's why they appear a little shiny as pencil does that when used over pastel. .Solar Active Region 1057 PST 40mm 8 mm TVP eyepiece. April 1st Hazy conditions now and again. AR 1024 July 6th 09:15 UT PST 40 8mm TVP eyepiece - 50X. Pastels and Staedtler Ergosoft Pencils on black paper. Seeing - Wilson Scale 3 Some very fine detail visible , the AR is not as busy as the 4th of July. The flares seem less active. I just managed this one sketch before the clouds rolled in again. The AR fibrils stood out very clearly from time to time , the plage was much less vibrant than July 4th. The mottling held well defined patterns over large areas. One of the sunspots appeared larger than previous and the penumbra was visible without going up and down the bandwidth of the scope. I sketched in the spots alone first then tuned the scope to pick out the other details visible in the h alpha. 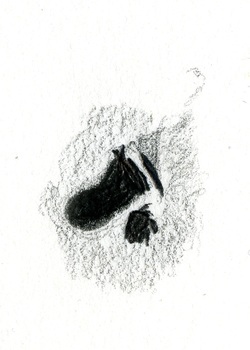 Today I decided to use pencil over pastel to try to achieve as exact a sketch as I could. That particular afternoon I just focused my eyes on Active Region 0960 and took a closer look at the active region filament. I looked closely at the swirling motionless movement that this interesting area offered me. I decided to follow the active region 0960 for a second day. I was interested to see how it had changed since Saturday . The paler areas around the spots was much more evident and the active region filament appeared less prominent. The plage seemed to be breaking up. So far this pale grey pastel is doing the granulation or the swirling dots until I think of a better solution. I got a look at this region early on the 11th, it was different again to the other views. You may think pale grey is an odd choice for depicting this area around the active region. In observing the swirling movement and powerful shapes,it is a least a defining colour . I am thinking about other ways of showing this busy sub drama, which is acted out around areas of major league drama on the visible surface of our life giving star.